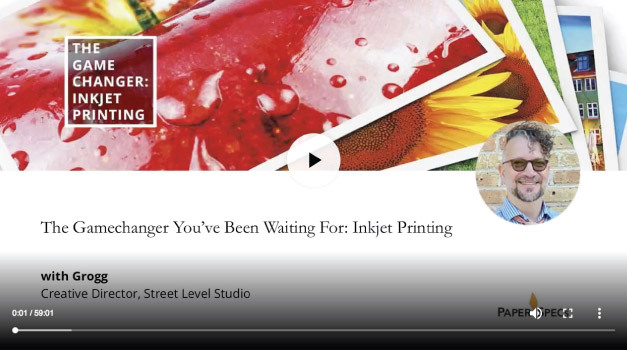 Here at Street Level Studio, we have mastered the art of designing for inkjet printing, an art we honed through our long-term partnership with Canon Solutions America and the relationships we’ve built with print vendors. We have learned to control the aspects of design in order to make completing inkjet projects a true art form. Therefore, you can imagine our excitement when our friends at PaperSpecs asked us to do a live webinar on the subject. Working with PaperSpecs was a true honor. As a design powerhouse full of examples and advice, PaperSpecs has brought together an intelligent community of print experts to bring information to designers across the globe. When deciding how to approach this detailed and vast topic, Street Level Studio’s creative director, Grogg, wanted to use the words of Milton Glaser as his guiding light: how to control and master the design process to optimize it for inkjet printing. If you’re on the non-design end of marketing (e.g. numbers, messaging, decision making, etc. ), there are plenty of reasons to learn more about inkjet—particularly when it comes to variable data printing and the chance to truly personalize a piece with multiple opportunities and potential cost savings. Of course, the specifics will need to be discussed with your print provider, but there’s something everyone in the marketing department can glean from this information. So join your fellow creatives that tuned in for the live presentation and take advantage of this rare access and watch the webinar for yourself!